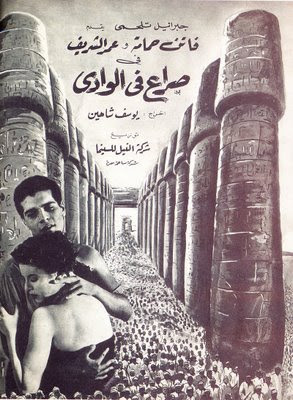 In Chahine’s second film Ibn al-Nil (Nile Boy, 1951), shot on location and made when he was only 25(! ), I love the panning shot of the young Hemeida racing through fields dotted with gorgeous palm trees to get to the station and watch the train pull out, the defining symbol of freedom and flight from the sleepy village life he hates. In the next scene, the camera moves away from the young Hemeida standing on the platform then moves back in to see the older Hemeida standing in the same place in the same pose. The older Hemeida is played by a youthful Shukri Sarhan in a wonderful turn as the sullen rural boy who grudgingly marries then abandons Zubayda (Faten Hamama) for the big city. There are many scenes to love in Sira’ fil Wadi (Struggle in the Valley, 1954), again shot on location (in Luxor), but my absolute favourite is the one when Faten Hamama and Omar Sharif first meet (of course). This is the most romantic scene I’ve ever seen on film, effortless, charming, masterfully directed and gracefully acted. An impossibly handsome Omar Sharif (in his first screen role) plays Ahmed, the young agricultural engineer who helps the farmers produce a superior sugarcane crop that bests the harvest of Taher pasha, played by the deliciously evil Zaki Rostom. Amaal is the pasha’s daughter and a childhood playmate of Ahmed. They reunite after an 8-year absence on Amaal’s return to the village; I’ll always remember Ahmad calling out to her “Batates!”, her nickname from their childhood banter. 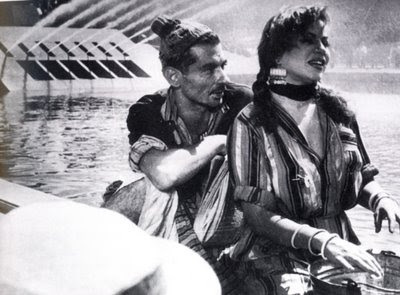 With this film, Chahine not only created the most dashing couple in Egyptian film (and real life), but he gave us some stunning images of the countryside, images that were later echoed by Atef Salem in Struggle on the Nile (1959) and Barakat in The Nightingale’s Call (1959) and al-Haram (1965). One image I can’t forget is the procession of villagers grieving over their flooded crops, put to a haunting score of sorrowful humming and portentous drums. Inta Habibi (1957) is barely mentioned when people review Chahine’s work, but it’s a comedic and cinematic gem, rivalling Fateen Abdel Wahab’s best comedies while crafting some indelible images of the landscape and people of Aswan. The priceless scene when Mimi Shakib and Serag Mounir enlist the milkman and the manservant to awaken their son Farid has me in stitches every time. 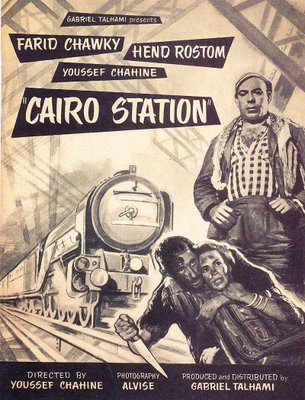 Only a year later, Chahine produced the vastly different Cairo Station, a loving rendition of the invisible porters and peddlers trying to survive in Cairo’s teeming train station. This is where Chahine himself memorably played the lonely, limping newspaper boy Qenawi, in love and obsessed with the flirtatious soft drink seller Hanouma (Hind Rostom), who has her eyes set on the virile and aggressive Abu Sri’ (Farid Shawqi). Directors before and after Chahine have had a love affair with filming in trains and on platforms (my absolute favourite is the final scene of al-Bab al-Maftuh, 1964), but I don’t think anyone came close to Chahine in exploiting trains’ range of aesthetic possibilities. The famous, tragic denouement on the empty tracks is what I remember most about Cairo Station, especially the intervention by the great thespian Hasan al-Baroudi. I can’t remember any scenes from Chahine’s later films after Eskenderiyya Leih? (I haven’t seen Heya Fawda), probably because I just didn’t understand them. I like inventiveness and formal experimentation, but I was put off by the later films’ excessive allusiveness, campy style, and aggressive didacticism. Chahine’s autobiographical turn after Eskendriyya Leih? struck me as less compelling than his gift at probing Egypt’s landscape and the textured lives of its inhabitants. And he seemed less capable of eliciting excellence from his actors than he had in earlier films (and no wonder, if he was working with the likes of the horrid Nabila Ebeid). 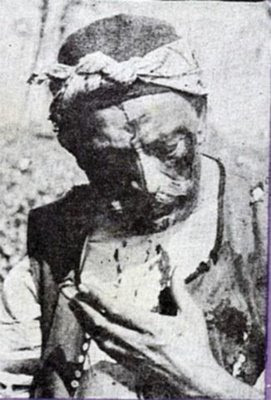 When I was a child and first saw al-Ard (1969), I didn’t understand it but cried during the iconic final scene of Muhammad Abu Swaylam mercilessly trussed up and dragged by a mounted policeman, his bloodied fingers digging tracks into the soil, just as a village notable had ominously predicted in an early scene. When I watched the film again today, I saw a penultimate scene no less powerful. As government troops chase and beat down fleeing villagers, Abu Swaylam stands still in the midst of his field, a spectre of a smile on his stoic face. A close-up shows drops of his blood sliding off the back of his hand and landing on the snow-white cotton plants, the fruit of the earth he refuses to part with. 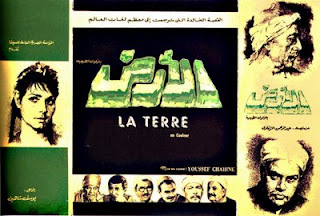 Youssef Chahine didn’t create the character of Abu Swaylam, that’s Abdel Rahman al-Sharqawi’s brilliant doing. But Youssef Chahine embodied this willful, reticent fellah in the peerless Mahmoud al-Meligi, directing him in a masterful, transcendent performance that brought me to tears again. For this and his many other enduring, wondrous creations, we can all be grateful.